Blog August 30, 2018 0 Milan A. One way to choose a perfect air purifier is to look at the ratings. There are several ratings you can look at, but most important is CADR rating. This rating will tell you how powerful is the air purifier you are looking to buy. If you have zero knowledge about air purifiers, then you should look at CADR rating because only that rating may help you pick a right air purifier. 1 What is the Air Purifier CADR Rating? 3 How is CADR Determined? 4 How Correct and Useful are CADR Ratings? 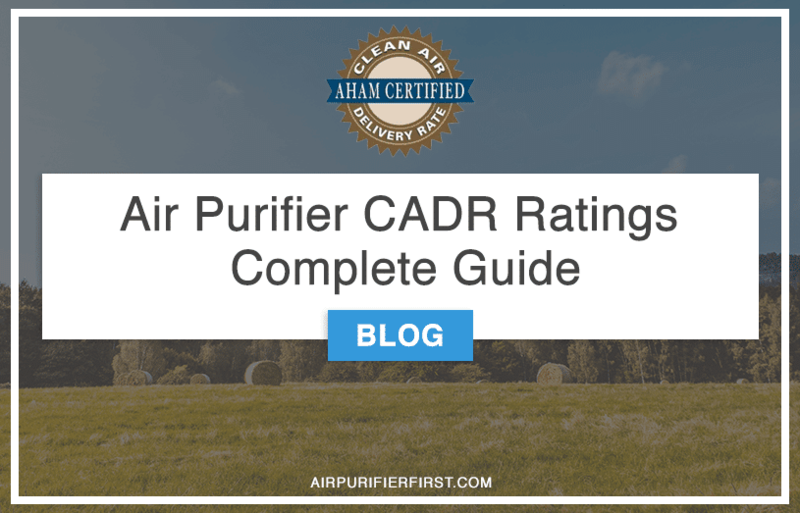 CADR stands for clean air delivery rate. In general, that is a numerical value that represents how much of the particles of a specific size is removed from the air. The measure is taken in CFM which stands for cubic feet per minute. The measurement is done usually for pollen, smoke, and dust. These three pollutants are small in size and the most unwanted particles in the air. Most of the people who are looking for an air purifier want to remove pollen, dust or another small allergen. A significant benefit from CADR rating is the comparison between two air purifiers. For example, if you found two almost identical air purifiers and now you don’t know which one to choose, you could check the CADR rating and pick the better one. CADR rating is also useful when you are reading the product description, and you read that the air purifier is doing an excellent job and is capable of removing even the smallest particles, then you should also check CADR rating to see how efficient the purifier is in the filtering job. CADR for every air purifier is determined by so-called ANSI/AHAM AC-1 test. It is actually a very simple test. First, the testing agency puts the air purifier in a testing chamber. After that, they measure the contaminants in the room. After that, they turn on the air purifier which will work for 20 minutes. Then they measure the air in the chamber and make conclusions about how good is the air purifier in removing particles from the air. How Correct and Useful are CADR Ratings? CADR ratings are done by AHAM (Association of Home Appliance Manufacturers). AHAM is objective in their measurements, and by that, we can say they are trying to be as accurate as possible at making the CADR ratings. Usefulness of CADR rating we already stated. When you can not decide which air purifier to pick, you can simply look at CADR rating and make a decision. By using CADR ratings, you can make a right choice and always pick the best air purifier. Unfortunately CADR ratings are not the only things you should look at when buying an air purifier. You also need to consider all other important facts, and one of them is the ability of an air purifier to remove tiny particles. Not all of the air purifiers are capable of removing small, most dangerous particles. CADR rating will not tell you anything about that, because of that you should always consult about other facts about an air purifier. Every test has its own limits, and the same thing is with CADR. It would be nice that CADR is a rating which can rank air purifiers without looking at any other facts. But the reality is different, and CADR ratings have its own limits. I have already stated that the CADR rating says nothing about the effectiveness of removing the tiniest particles which are actually making the biggest problems to people’s health. Another problem with the CADR rating is short testing. Air purifier works only for 20 minutes, and some air purifiers will decline over time, and their effectiveness will drop. Also when the tests are done air purifier is working on maximum power. So you should keep that in mind and maybe look for a more powerful air purifier which can have high CADR ratings on lower settings. Ionization process may give wrong CADR rating. When ionization setting is turned on, the CADR ratings may be wrong because the ionization process will make smaller particles bigger and those particles are often not removed from the air by the air purifier. Often this ionized particles are heavy and drop on the floor or hang on the walls, but they are still in the room and not removed. And since the CADR is measuring the pollution in the air and not on the walls or floor then the CADR number for air purifiers with ionization turned on may be wrong. You should still look at CADR ratings because often that is the key factor in choosing an air purifier. But you should keep in mind that more expensive air purifiers are more effective even if their CADR is lower than CADR of some cheap air purifier. CADR numbers should be considered on air purifiers in the same price range. An expensive air purifier will always be more effective than the cheap one, no matter of CADR rating. You should always look for AHAM approved air purifiers because they are certified and have CADR ratings. If you are looking to make a decision among the air purifiers that are in the same price range CADR rating is the key factor which will help you make a right choice without regrets.